Opens : 9.30 a.m. to 5.30 p.m daily. The city Udaipur has many things to be proud of. And City Palace Museum is one such interesting tourist hub in Udaipur. 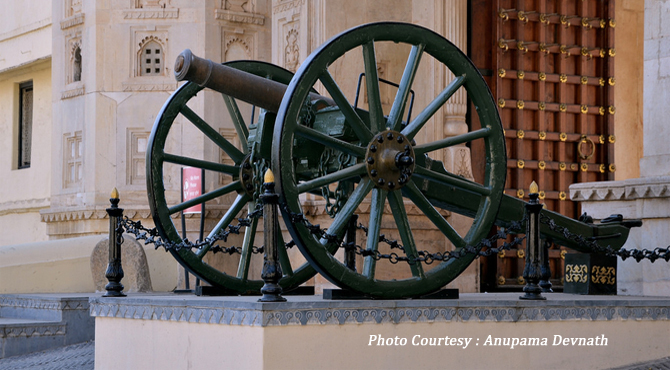 It is a unique museum located amidst an impressive Udaipur City Palace Complex. Also known as Pratap Museum, the museum is the jewel in the crown of the Udaipur City Palace. It has a remarkable collection of ancient sculptures, paintings, antiques, artifacts and inscriptions of the bygone era. One of the most visited tourist attraction in Udaipur and the largest palace complex in Rajasthan, the construction of the palace was began by Maharana Udai Singh during the period 1620-1628. Built in granite and marble and surrounded by crenellated fort walls, the palace stands on a crest overlooking the Pichola Lake on the east bank. Various Maharanas contributed to this structure for over four and a half centuries, but it still maintains a graceful uniformity of design. Its layout has the traditional Rajput Style, and also blends Medieval European, Mughal and Chinese architecture. A part of the city palace and the 'Zenana Mahal' (Ladies Chamber) was opened to the public as the City Palace Museum. Estabished in 1890, this is one of the earliest museums in the state. The palace has some areas reserved as royal residence. Armory gallery, Manak Mahal (ruby palace), Moti Mahal (pearl palace), Zenana Mahal, Krishna Vilas, Chini Mahal are some among the galleries in the city palace museum. The City Palace Museum stretches 33 meters high, 333 meters long, and 90 meters wide. The interiors of the museum is adorned with artwork, beautiful paintings, inlay glass work, antique furniture and colourful enamel. Exhibits of the Museum are categorized according to a theme and can be found in distinct galleries. It can be enter through the entrance of the palace complex and pass through the 'Ganesh Deori' meaning the door of Lord Ganesh. The way leads to a series of several pavilions and halls, corridors, courtyards, terraces and hanging gardens each with a distinct theme of its own. This door opens up in the 16th century Rajya Angan (royal courtyard). It houses many portraits of erstwhile Mewar rulers. One of the oldest and main part of the palace, Raj Angan is blesses with many portraits and personal weapons and armours of erstwhile Mewar rulers. Many memorabilia of Maharana PRATAP SINGH I and paintings are also displayed. The Manak Mahal houses a fine collection of crystal and mirror works and fine miniature paintings in thematic rows can be found at the Krishna Vilas. Zenana Mahal exhibits arms and armor, remarkable paintings and photographs, processional accessories, throne, royal turban and various other objects that relates to various Maharanas of Mewar and Sisodia. Zenana Mahal leads to Lakshmi Chowk a beautiful white pavilion. Moti Mahal has beautiful mirror work and the Chini Mahal has ornamental tiles of colour blue and white all over. There is a gallery devoted to the legendary warrior Maharana Pratap and his horse Chetak that displays the original armor and weapons used during the great battle of Haldighati in 1576. The antique paintings of Mewar, the turban of prince Khurram later on called Shahajahan, who built world fame Taj Mahal has been displayed on City Palace Museum as a token of friendship of Maharana Khazan Singh. The Museum is open 9.30 a.m. to 5.30 p.m daily.